The current shows at the Philadelphia Photo Arts Center, the winners of their annual Contemporary Photography Competition, despite their formal differences, are strangely alike--and entirely by accident. Christine Elfman's Even Amaranth is an eerie selection of nature scenes and images of Classical sculpture, while Mark Jayson Quines' companion exhibition NOBODY comprises snapshots of people and objects in everyday settings, interwoven with actual examples of these valuable artifacts of daily life: smartphones and Air Jordans sneakers. Despite the vastly different nature, style, and subject matter of Elfman's and Quines' practices, Even Amaranth and NOBODY cannily come together to form the two halves of the answer to the question what lasts? What is eternal? What will outlive us after we are gone? 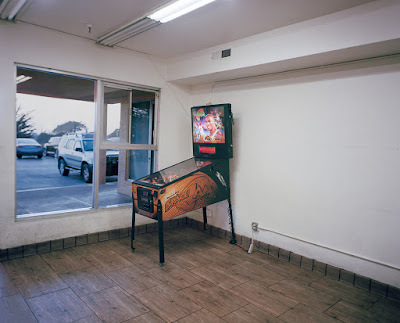 According to this year's juror Christopher McCall (of Pier 24 in San Francisco), the winners struck him with their storytelling, "message," and "voice," which he found so clear in their vastly differing submissions. After winning the competition, the artists worked alone on their shows, located in two carved-out galleries in the main space of the Photo Arts Center, selecting the best works from their winning entries. Christine Elfman's Even Amaranth immediately encourages viewers to think about permanence, and what can survive the weathering of time. Her silver gelatin prints of trees, forests, and snowy hills, all purposefully devoid of people, evoke an atmosphere of serenity, as if they've been this way forever, untouched by humankind. 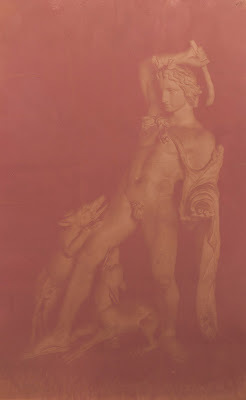 The images of Roman sculpture, on the other hand, betray a deliberately obvious human manipulation: Elfman's show title Even Amaranth derives its name from plant dye, which makes her photographs appear faded, almost overexposed. Still, the mere fact that we still have these marbles in 2018 attests to their longevity and ability to endure, just as nature endures; Elfman drives home this point in a magnificent grouping of three works--two nature prints of fallen trees and a orangey-dyed snapshot of a sculpture of Acteon Attacked by His Hounds--mirror one another formally, with the angle of Acteon's torso echoing the angle of the tree trunks. Elfman's emphasis on formal similarities continue on the opposite wall, where the ridges of snow crusting the surface of a cliff visually rhyme with the drapery folds of another marble sculpture. 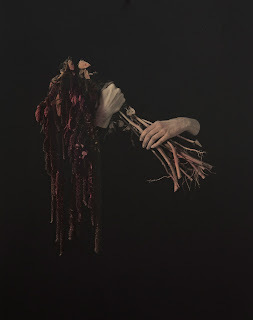 Even when Elfman does include actual people in her compositions, they are deliberately made to look like marble; the disembodied hands in several works hold wilting flowers and branches, already an allusion to their death and decay. Despite their frozen appearance, the hands (and their human owners) won't last forever, and the branches, severed from the tree, will eventually fade into nothing as well. Mark Jayson Quines' NOBODY complements Elfman's theme of permanence, and what ultimately lasts. Elfman's introduction of the human element to her work is purposefully fragmented and meant to resemble the marble sculpture she depicts elsewhere in the gallery space. 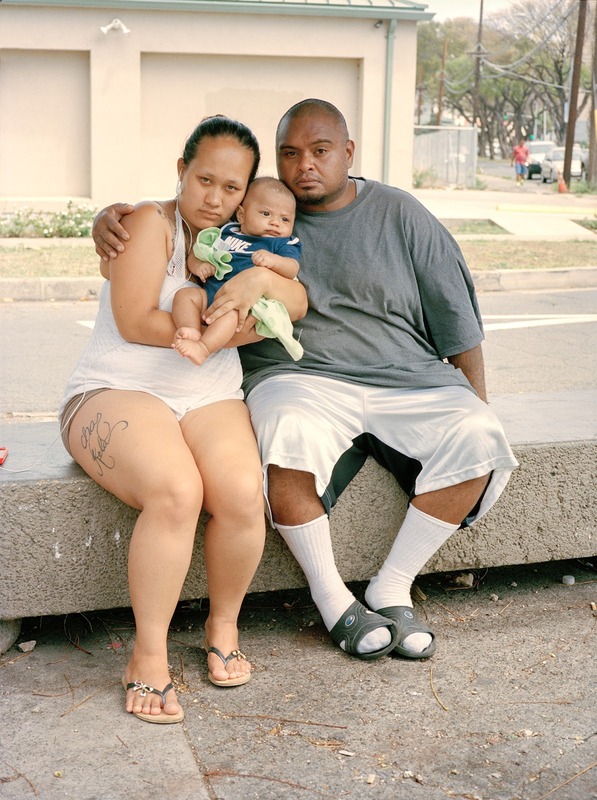 Quines' occasional portraits of people, scattered through his images of urban scenery and commodities, make it clear that he is concerned with the active relationship between living, breathing people and what they want to buy as an exploration of human nature. If Elfman asserts through her imagery that nature and the work of man--namely, the Greek statuary--are what lasts, then Quines' humanistic portraits of object-oriented desires and excess assert that it is human relationships and emotions that remain, and that continue to exist across all categories of humanity. 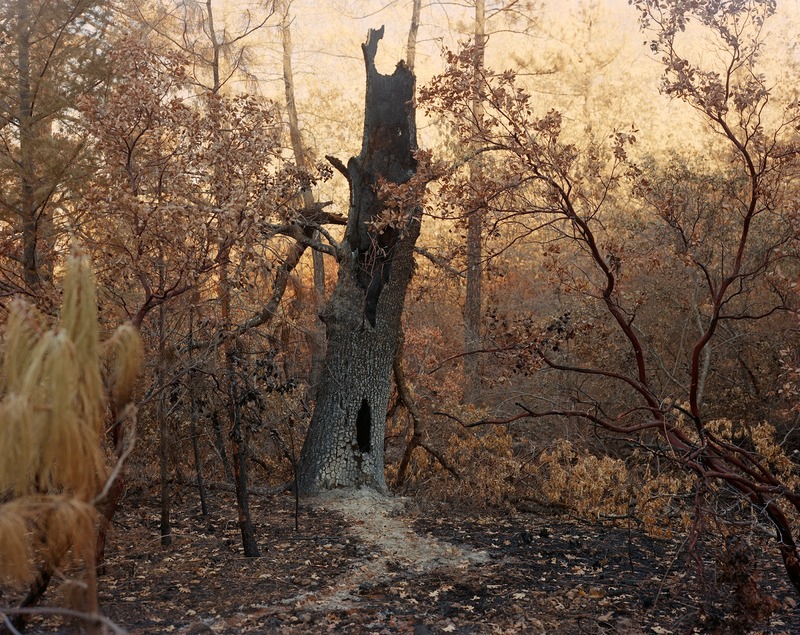 Quines' carefully juxtaposed color photographs and objects represent temporal journeys, just as Elfman's ancient marble sculptures and stately, wizened trees do, but to make the opposite point. The objects Quines has chosen either to display on their own or to depict in his photographs--smartphones, Air Jordans sneakers, (deflated) basketballs, a pinball game based on the film Space Jam, a gated mansion--are precisely not meant to last: they are meant to be lusted after, purchased, used, discarded, and replaced as consumer goods. 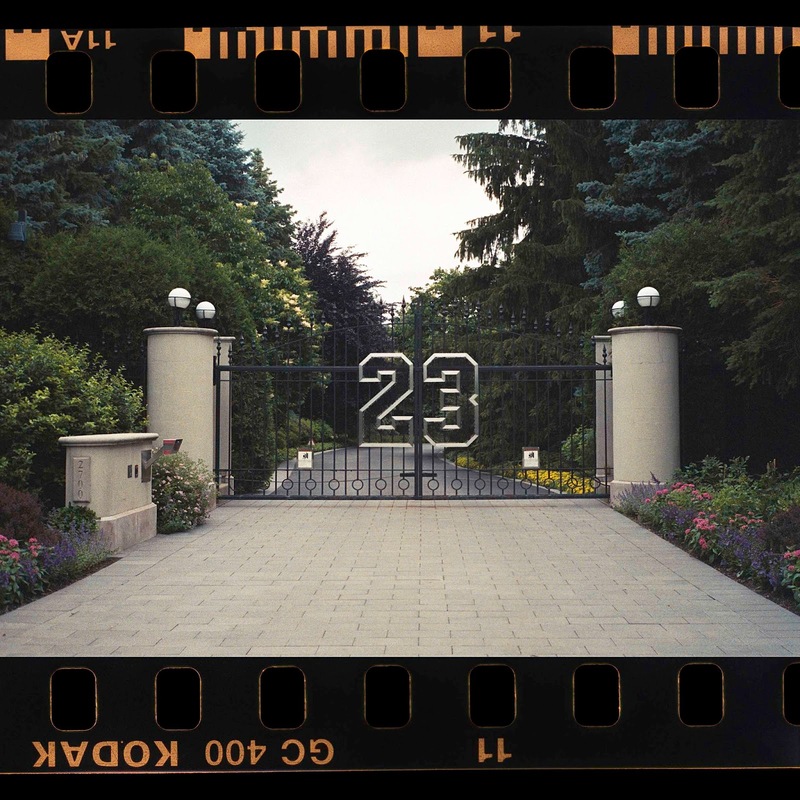 What does last, per Quines, is the human element that drives us to want these disposable artifacts (and, in the case of the sneakers, smartphones, and mansion, signify wealth and power), rather than the objects themselves. A pamphlet posed in a shrine-like display on one wall of the gallery, titled "Money: Hard to Get But Easy to Spend," which dates from 1971 and originates from Nigeria, makes it clear that the preoccupation with money and its power of acquisition are far from a contemporary American phenomenon. Quines' inclusion of real people in his photographs works on a similar level: individuals will inevitably die, but the relationships between them (seen in a particularly tender portrait of a family waiting for their bus) are the lasting thing. Furthermore, he presents the element of celebrity worship, as evidenced by the allusions to Michael Jordan (Space Jam pinball, sneakers, a trading card) as something that will endure, even if the arcade game will break, the sneakers will be worn down, the card will be thrown away, and Jordan will pass away, as we all do. You draw interesting parallels between these artists' works. Nice!